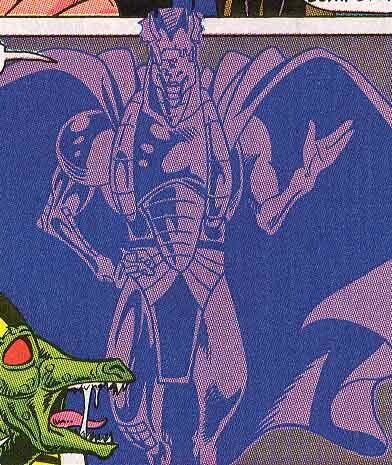 Powers/Abilities: In his original body the Technocrat would have had the same potential for powers as any other Kymellian had, though it is currently unrevealed if he ever developed any outside of possibly teleportation. His pseudoplasmic body was infinitely malleable, though without an atmosphere it was unable to hold a pre-programmed shape and reverted into a liquid state. Presumably if re-exposed to an atmosphere the pseudoplasmic body could resume its pre-programmed form. While the full weapons array of his body armor is unrevealed, he was shown to fire a power-neutralizing "goop" from his glove. As part of his base's computer system the Technocrat was able to observe anyone anywhere on/in his "body" and project a holographic image of himself anywhere on the base to interact with visitors. He was also able to "see" (using his computers) what his other pseudoplasmic creations saw, even when they were on another planet, and direct their actions. He could teleport objects to and from his base over vast (galactic scale) distances, though it's unclear how much of this was native Kymellian teleporting ability and how much was done using machines on his base. He had control over the other machines that kept the base in working order, and evidently could rearrange the matter of small objects at will (or else he teleported Meraud's hand restraints away; the story was a tad unclear which it was). (Power Pack Holiday Special#1 (fb) - BTS) - The Technocrat was a brilliant engineer and inventor who evidently thought technological products were far superior to anything biology could produce, and believed the Kymellians were better off in space than on a planet. Besides designing spacestations for himself and others, he invented living pseudoplasm, a semi-solid thick liquid that could be programmed to duplicate living beings on a molecular level, fooling even fairly sophisticated Kymellian scanners, which led to the substance being outlawed on Kymellia. Centuries ago, when the Kymellians destroyed their original homeworld Kymellia due to a miscalculation in their formula for matter/antimatter energy conversions, the Technocrat built the space station Kymellia II to house the survivors as their new homeworld. An unspecified time later (though evidently still "centuries ago") the Technocrat was banished from Kymellian society for unrevealed crimes. He then made a moon-sized space station his new home and populated it with his pseudoplasmic servants. Under unrevealed circumstances the Technocrat transferred his consciousness into the station's computer system, and created a pseudoplasmic duplicate of his original body to physically interact with others. The fate of his original body is unrevealed. (Power Pack I#56) - The faux Alex was awakened in the middle of the night by Pack member Tattletale (Franklin Richards), who had had one of his "special dreams" (Franklin's powers had been reduced down to precognitive dreams at this time in his history) about his friend Nova (Frankie Raye) fighting the cosmic entity Star-Stalker, whose path of destruction was leading it towards Earth. While getting ready to find Nova, "Alex" discovered he was starting to loose his hair; the idea that he was going bald at age 13 threw him into a panic, though he didn't tell anyone about it right then. The Pack had their smartship Friday to take them to the planet shown in Tattletale's dream, where they found an Elan child that had been injured in the Star Stalker's initial attack on the planet. Initially feeling useless because the others were able to free the child without his help, "Alex" examined the alien and wished for some way to help it live. He then started to glow with an unknown energy similar to the Kymellian's healing power that also managed to seemingly heal the alien child as well. Unable to help Nova stop the Star Stalker, the Pack could only watch while the Stalker drained all of Nova's powers into itself, then settled down to sleep while Lightspeed (Julie) rescued the now-human Nova from dying in space. "Alex" got the idea to give the Stalker even more power while it was unconscious in an attempt to overload it and stop its menace for good, so he had the Destroyer (his brother Jack) feed it all the power he had stored up in himself, forcing the Stalker to create a cocoon around itself. 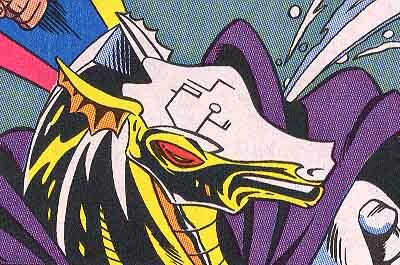 It then teleported itself away, to land on the next planet in its path, Earth. . . .
(Power Pack I#57) - Back on the smartship the Elan's condition began to worsen and it started to fire energy balls from one of its antennae. "Alex" immediately turned cloudy when one of the balls came towards him, but he was unable to stop another ball from hitting Tattletale and knocking him unconscious. When Jack managed to absorb enough of the Elan's energies to allow Friday to cauterize its wound, "Alex" reflected on how he was unable to solve the problem, then panicked when he noticed his hair loss had already created a noticeable bald spot and quickly recombed his hair to hide it. Back on Earth, the Pack soon found the Stalker rampaging through Central Park and quickly attacked the beast, with "Alex" using his cloud powers to hide the Stalker so its appearance would not create more of a panic than it had already caused. The Pack was able to keep the Stalker busy long enough for a now-awake Nova to go to the Baxter Building and retrieve a Stimulator (a device that can restore a superhuman's lost powers) and set it up to drain the Stalker's powers into herself. It worked, but the settings were slightly off on the Stimulator, and Nova became a power-mad brute herself. . . . Meanwhile, "Margret Power", following a feeling that something was wrong, got up to check on the kids, then ran hysterically back to her husband "James" and woke him up. "James" checked the kids" rooms himself, then lied to his wife and told her the kids were really still there to calm her hysterics. While getting "Margret" a cup of chamomile tea, "James" realized that he had a good idea that the kids were really super-heroes, and put in a call to Tattletale's father, Reed Richards (of the Fantastic Four), to tell him what he suspected: that their kids had formed their own super-team and were out having adventures and not telling their parents. (Power Pack I#58) - While Tattletale was off getting a weapon from Galactus to stop Nova, "Alex" tried to knock down Nova with a combination of his superdense form and Counterweight's (Katie Power) gravity power, but found Nova was able to counter both powers easily. "Alex" got the idea to douse Nova with water to snuff out her powers, so the Pack stole a nearby water tank and dumped it on Nova, but "Alex" then found that the backlash from the steam was causing him to dissipate before he pulled himself back from that. Meanwhile "James" met with Reed at an outdoor cafe to discuss his suspicions, but the talk was interrupted by noise from the battle. Rushing towards the fight, "James" was shocked to find that his kids were putting themselves in danger to stop Nova. While "James" could only stand around in a state of shock, Reed grabbed the Stimulator and reset it to absorb enough of Nova's powers in an attempt to return her to her right mind, and "Alex" used his cloud power to hide his family from the just-arrived news cameras. At this point Tattletale returned from space with an Elemental Obliterator (borrowed from Galactus, it had the same tendency to kill the person wielding it as the Ultimate Nullifier did -- when the big G. puts triggerlocks on his guns, he doesn't fool around!) 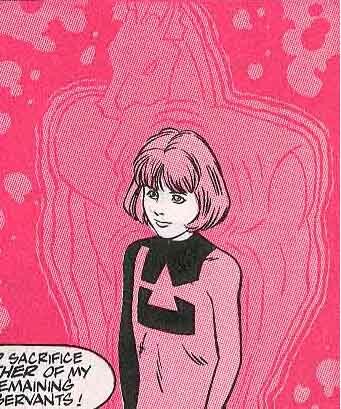 to use on Nova to stop her mad rampage, while "James" kept Reed from stopping Tattletale's suicidal gesture. When the Elan decided to be the one to sacrifice itself to stop Nova, "Mass Master" wished for a way to somehow save the Elan from getting killed, and put a density field around the Elan, then found he could suddenly link his powers with his siblings and used their combined powers to push the Elan away from the gun before it self-destructed. The restored Nova then left Earth to continue her work for Galactus while the Pack and Reed left the park, not knowing that while painting in her studio, "Margret" had seen the newscasts of Power Pack fighting Nova, and that the revelation/confirmation that her children were now super-heroes had driven her into a massive hysterical attack, denying what she had seen. . . . .
(Power Pack I#59 - BTS) - "James" asked Richards if Tattletale could move in with them for a while in an attempt to show his wife that their kids were not the only ones with superpowers, and somehow bring her out of her catatonic state. Richards enthusiastically agreed to have Franklin stay with them for a short time. (Power Pack I#59) - A day or so later "Alex" woke up before everyone else in the house did, and was distressed to realize he was still going bald. Deciding there was only one solution, "Alex" left the apartment and went to a local barber and had his hair cut down to a very short buzz cut. Later that morning "James" made a (barely edible) breakfast for the other kids while discussing a trip to the circus later that day (unbeknownst to them, the circus being advertised was -- wait for it -- The Circus of Crime!). "James" was startled when he learned Julie was more interested in seeing a rich handsome Indian prince that the papers announced was going to be there rather than the acts themselves ("his" little girl was interested in BOYS already!! ;) ) While "James" served "Margret" breakfast in their bedroom to avoid upsetting her further, "Alex" returned to the apartment. The two talked briefly in the kitchen. "James" berated "Alex" for going out without saying anything to anyone, and "Alex" revealed only that he had a personal problem that he didn't want the others to learn about, leaving "James" to assume it was simply a problem associated with puberty. "James" resolved to try not to ride "Alex" too hard, and to be more supportive of him while he going through puberty. When "Alex" showed the others his new haircut, "James" and the kids were taken totally by surprise by the drastic hairstyle change. After Franklin arrived and mentioned he liked "Alex's" new hairstyle because it was shorter than his, "James" made a joke about how lots of people get bad haircuts every day, which only served to put "Alex" deeper into his funk, and "James" to worry over him again. Later at the circus the kids witnessed the theft of the Indian Prince's ultra-valuable crown jewel (which he was wearing in his turban) by the Circus" Clown, Bruto the Strongman, the Human Cannonball, the acrobatic Great Gambonnos, and the cowboy Livewire (they had decided that the single jewel was that great a prize to go against the Ringmaster's direct orders to not pull a heist during the show). The Pack decided to intervene and changed into their costumes where they were seated in the bleachers and went on the offensive. A herd of various animals released by Clown and Livewire rampaged through the tent and almost trampled "Mass Master" underneath them, before he shrank himself down to a much smaller size to avoid being knocked down (why he didn't just turn cloudy I have no clue). The animals were then degravitized and juggled by Katie. "Mass Master" found the turban, and barely missed being crushed by the Strongman. Unable to see anything carrying a turban at that small a size, "Mass Master" decided to return to his original size, happily wearing the turban as "Prince Alex -- Ruler, Mover, and Shaker" until the Clown stole it off his head. "Mass Master" used his cloud form to herd the animals to safety when he noticed the Ringmaster now had the turban. The Pack could only watch while the Ringmaster decided to hand the turban back to the Prince under the pretense he was actually recovering it for him, then used his hypno-disc to make the Prince (and the just-arrived policemen) forget the theft attempt by his employees. Meanwhile, back at the apartment, "James" entered "Margret's" art studio to see how she was doing, and decided to look her most recent paintings over. He was shocked to find them all dark and grim in nature, like she had become suddenly obsessed with death and destruction. "James" found "Margret" in their bedroom staring out the window, oblivious to his presence, and staring at a vision of attacking monsters. He tried to talk to her, but the kids came home right then, and he had to go quite them down so as to not disturb "Margret". While "James" worried over his wife's sanity, "Margret" continued to stare at the vision she was experiencing. Later that night the kids stayed up late to watch TV. The others commented on how the new haircut made "Alex's" nose look bigger, and how the light from the TV made his hair look longer in the middle than on the sides. Disgusted by their comments, and experiencing a pounding headache, "Alex" made his way to the bathroom, and to his horror found that his nose really was bigger -- far bigger than any human nose should be, and that his hair had suddenly sprouted a Mohawk literally in the last few hours. . . . .
(Power Pack I#60) - The next morning an upset "Alex" revealed to the rest of the team that he had turned into a Kymellian overnight. The others tried to comfort him with little success, but when Jack warned that their father was coming "Alex" quickly turned into cloud form and left via the window, grateful that his power at least still worked, though he now had an urge to allow himself to dissipate completely and essentially kill himself. Meanwhile "James" informed the kids that their mother "Margret" had now recovered and wished to see them before going off on their first day of school, and warned them not to mention their powers at all in her presence. While the kids were visiting their mother, "James" asked Jack about the whereabouts of "Alex", and was told "Alex" couldn't wait to see girlfriend Alison after summer vacation and had left early to see her, disappointing "James". "Alex" watched in cloud form while the others walked to school, then solidified on a cliff in Central Park to bemoan his fate, and was startled when a cloud that wasn't his formed around him. It disappeared a second later, leaving "Alex" to believe it was just a figment of his imagination. A few hours later the still-brooding "Alex" was contacted by Tattletale's dreamself and told that old Fantastic Four foe Puppet Master had somehow evidently taken control of Franklin and was forcing him to fight a quartet of turtle-like aliens at a local pizza restaurant (see comments below). He also told "Alex" where the Puppet Master was living then (in a house located on their route to school). While the rest of the Pack were trying to rescue Tattletale from the aliens, "Mass Master" entered the Puppet Master's house to somehow stop him from his mad plan, only to discover the Puppet Master napping on the couch and a mentally impaired boy playing with toy figures of Franklin Richards and a set of "Adolescent Microwave Shell-Shocked Amphibians" toys (called that because apparently there were legal reasons Marvel couldn't use the name "Teenage Ninja Mutant Turtles" in even a one-panel reference to an actual real-life cartoon. Hey, I'm not a lawyer nor do I play one on TV. I really don't know what the legalities of this situation might be.) that Puppet Master had made for him from his special clay. When the Puppet Master realized what chaos Morty (his (step? )son) inadvertently caused everyone he apologized, since he never foresaw the possibility of actual aliens who were almost identical to the cartoon characters could exist (and thus be controlled by Morty), or that Morty would go against orders and get into the room where PM kept the dolls he used to control others and play with them. Meanwhile, "James" and "Margret" had spent the day enjoying themselves and celebrating "Margret's" recovery. They were sitting at the kitchen table laughing when the kids got home from school. "James" told Franklin about his parents" calling and told him he could use their phone to call them back. After Franklin finished his phone call "Alex" returned to the apartment, where he and Franklin had a small talk about "Alex's" transformation, with Franklin reassuring "Alex" that he was going to be all right no matter how he looked. The talk was interrupted by "James", who decided to confront "Alex" over his strange behavior. "James" was shocked by "Alex's" new appearance and was in the process of comforting a distraught "Alex" when "Margret" decided to enter the room herself to see what was going on with "Alex". When she saw her son's new look, she immediately fell back into her catatonia and collapsed at their feet. 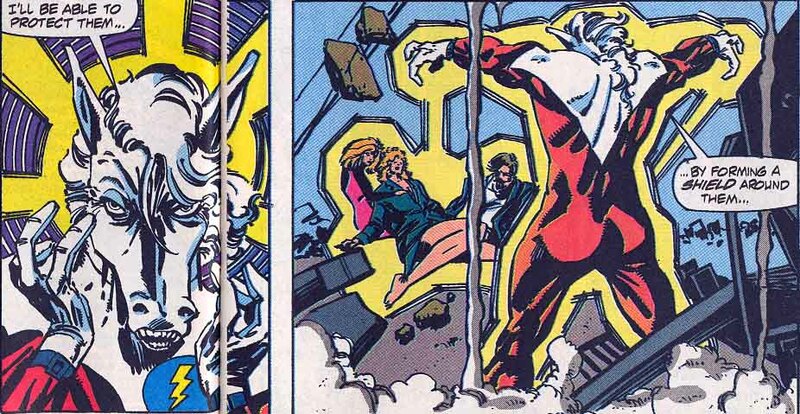 (Power Pack I#61) - During Friday's final approach to the Power's apartment building it was attacked by an energy attack from the Red Ghost, forcing it to crash-land in the Power's apartment instead of landing on the roof like it intended. Inside the apartment Destroyer (Jack) managed to absorb enough debris fast enough to create a "safe pocket" enabling his sister Counterweight to degravitize the debris above them and free themselves. Lightspeed asked Counterweight to degravitize their unconscious "parents" so she (Lightspeed) could fly them to safety, but Counterweight was afraid the roof would fall on them if she remover her powers from it. "Mass Master" managed to reach Lightspeed and their "parents" and placed a density field around them to keep the falling debris off them, but failed to put one around himself in time to avoid being knocked for a loop himself by the destruction. Tattletale managed to use his dreamself to take control of "Mass Master's" body just long enough for "Mass Master" to recover, and to send his dreamself to his parents for help while "Mass Master" protected his body and the others with the density shield. Power Pack, their "parents", Raymond (who had been pretty much a bystander in the book for the last few issues, and who had been out in outer space with Friday and the Elan), "Marty" the Elan, and the mechanical globe that housed Friday's consciousness were rescued and brought to Four Freedoms Plaza. There Mister Fantastic put Friday's "brain" on the computer equivalent of life support machines, and examined "Margret". 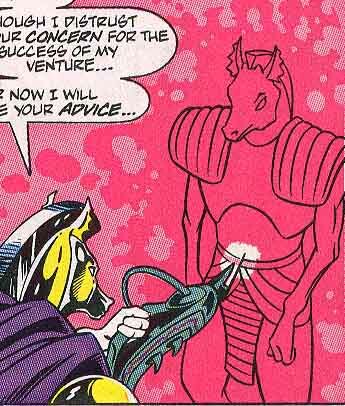 He quickly determined that he could undo Lord Yrik's mindlock on her (which Yrik had used on the true James and Margret Power ages ago to help Power Pack keep their secret superhero lives from their parents, and which everyone in this storyline assumed to be the real cause of "Margret's" breakdowns), but at the possible price of irreversible brain damage to her. While "James" thought those options out and wished for his family to be normal again, Mr. Fantastic examined "Alex", running various radiation and DNA tests on him. Told that the tests were inconclusive, a dispirited "Alex" rested his hand on Friday's globe, transferring enough of his healing power into it to revive Friday's consciousness again. It then gave Mister Fantastic some needed information on Kymellian genetics, which allowed him to adjust one of his many machines for use in reversing "Alex's" transformation. While "James" wished to have more time to adjust to this new development "Alex" pressed to have the reversal done immediately. During the painful reversal process the Red Ghost (disguised as Tattletale) entered the lab to steal Friday's globe and attacked, gassing Mr. Fantastic and throwing "James" into the reversal machine, causing it to go haywire and trapping "Alex" in his cloud form. While the Invisible Woman and Power Pack dealt with the Ghost and his Super-Apes, "Margret" heard the commotion from her room down the hall, and began to panic when she couldn't see where her husband and children were. While Raymond went to investigate the Elan found there was one thing that could calm "Margret" down enough for her to sleep, and was happy to see it working so quickly. 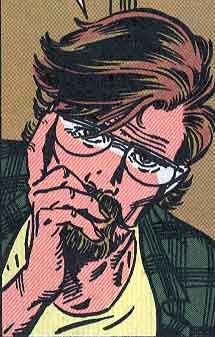 (As revealed next issue, the Elan altered its appearance to look like "James".) After defeating the heroes the Red Ghost laughed maniacally in his triumph, until he was suddenly confronted by "James", wearing a costume himself and ready to take on the Ghost and his Apes. 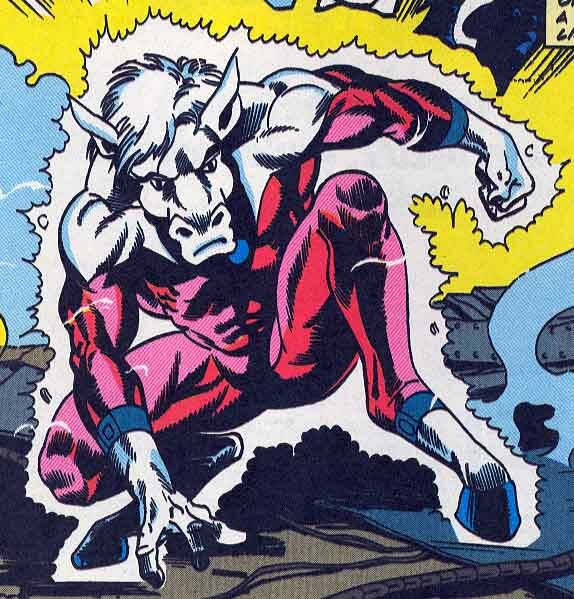 (Power Pack I#62) - While "James" (actually the Elan disguised as him; I assume he didn't drop the disguise to keep the Red Ghost from realizing that he was fighting another alien until it was too late) kept the Red Ghost and his Apes busy, "Mass Master" looked the devastation over and worried that the reason he couldn't reform his body was because he was already dead. He then heard a voice (the one from #60) introducing itself (though not naming itself) to him. The voice told him that it would be there if he really needed it, and then encouraged "Mass Master" to focus his thoughts on reforming himself, which he finally managed to do. Feeling much stronger and more powerful than before, "Mass Master" looked over his fallen friends and determined to use his new strength to put an end to the Ghost's schemes, and was puzzled by the voice's parting comment about "an ending shall come", and decided to worry about it later. "Mass Master" turned his newly-boosted healing power on his friends and fixed them up in time to witness the Ghost defeating the Elan (and eliminating its disguise) and explaining how he learned of the true power behind a smartship (evidently he intercepted some Snark transmissions and learned about Kymellian technology, then tracked down Friday and attacked it to steal its brain). The Ghost and his Apes escaped, but they only got as far as Sheep Meadow in Central Park before Power Pack caught up with them. While "Alex" was feeling like a useful member of the team again, the Ghost had one of his apes take on "Margret's" appearance in an attempt to make the others believe she had been taken hostage, but Tattletale quickly learned that the true "Margret" was still back at the Plaza asleep, and used his dreamself to force the Margret illusion from the monkey's body and to keep the Ghost from using his dematerializing power to escape, while "Mass Master" knocked out the monkey with a density field and "James" felled the Ghost with a right to the jaw. Later back at the Plaza, Mister Fantastic re-examined "Alex" again, and found that "Alex" had mutated just enough to keep him from being restored by the original process. Learning to accept his new form, "Alex" wandered around the Plaza a bit, and realized by watching the Thing and Ms. Marvel (Sharon Ventura) that he could still have something resembling a normal life. He also watched as the Human Torch, with some help from the Elan, finished reassembling Friday, and was among those teleported to the roof by the Elan (he wanted to get Friday back outside where it could fly again). "James" then thanked the Fantastic Four for their help with their problems, and told them he had decided to try out a couple of other sources for curing his wife: the Institute of Psychic Research in London, England, and the Collard Institute for Psychic Studies in the Caribbean. "James" "Margret", Mass Master", Tattletale, the Elan, and the rest of the Power Pack boarded Friday, then left the Plaza for London. (Excalibur I#29 (fb) ) - Power Pack, "James", and "Margret" arrive at the Institute of Psychic Research at London (apparently after taking "Margret" to several other experts besides the ones in Marvel Super-Heroes III#6) looking to see if they had a cure for her. The staff there instead took them down to a room and gassed everyone into unconsciousness, save for "Mass Master", who changed into his gas form and escaped via the same vent used to release the gas. (see comments below). He barely managed to reach Friday and the Elan (now officially called Marty by the others) before passing out. Friday recalled that the X-Men Nightcrawler (Kurt Wagner) and Shadowcat (Kitty Pryde) were currently part of the British team Excalibur, and flew to their lighthouse to ask for their aid. (Excalibur I#29) - A wary Excalibur (Captain Britain (Brian Braddock), Meggan, Phoenix (Rachel Summers), Nightcrawler) approached Friday after it appeared above their home base. Nightcrawler teleported inside where he found the unconscious "Mass Master" in a corridor. He woke "Mass Master" up, thinking at first he was an alien. After "Mass Master" updated Nightcrawler on his recent transformation, Friday allowed the other Excalibur members in, and "Alex" swiftly told them what had happened to his family at the Institute. After Excalibur agreed to help, Friday took them to the Institute, where Captain Britain, Megan, and Phoenix disguised themselves as a doctor, nurse, and patient respectively, to infiltrate the Institute, while leaving "Alex" and Nightcrawler to teleport in, since they'd have some trouble passing for normal (and again giving "Alex" the idea that there really was someone else in the world who understood being that different from normal humans as he was). (Brief comment: the dialogue makes it sound like "Alex" did the teleporting since Nightcrawler was still weak from recent injuries, but the teleporting field shown was clearly Nightcrawler's, so who really did what is unclear.) 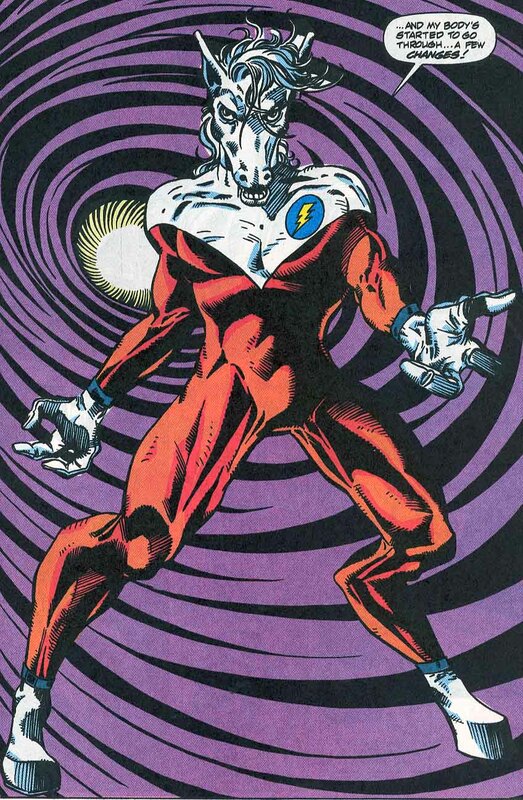 "Mass Master" and Nightcrawler soon found where the Power family and Tattletale were being held, but before they could contact the rest of Excalibur they were discovered and attacked. During the ensuing melee, Excalibur found that the Institute's staff had been transformed into demons, but they were themselves gassed before they could do anything about it. They were offered up to the demon's master, who turned out to be Nightmare. Preying on each of Excalibur's darkest fears, he quickly turned Phoenix into his own personal slave and had her track down and enslave the others, which she did. "Mass Master" (after merging with Tattletale, who had been following an unconscious summoning by Phoenix) confronted the enslave Phoenix after Nightmare turned her into his "horse" and rode her around. Nightmare used Phoenix's power to absorb "Mass Master" into their merged form, but then Tattletale used his powers to unmerge them all, then merged himself with Phoenix to break Nightmare's hold on them and return them all to the waking world. Back in the "real world", everyone woke up (Excalibur back in their tower, PP back on Friday) believing that what they experienced was just a very bad dream (in fact, if I read the ending correctly, they evidently didn't even visit the Institute at all the whole issue, let alone meet up with Excalibur), with "James" deciding that the trip over there had been a waste of time, just as Friday began final approach to the Institute's grounds. . . .
(Marvel Super Heroes III#6/2) - While "Margret" was treated at the Collard Institute for Psychic Studies in the Caribbean (with Marty to keep her company, I assume, since he isn't otherwise seen or mentioned in this story), "James" became engrossed with studying some aquatic phenomena (specifically some mysterious globes that had been found nearby) while the kids relaxed at the beach. Kate and Franklin asked "Alex" if he wanted to help build their sandcastle, but "Alex" decided it would be better for him if he stayed covered up (in jeans, overcoat, and baseball cap) to keep people from being frightened by his horsey appearance. When the sight of a finned creature swimming in the ocean sent the beach's population running away in a panic, "Alex" ran towards the ocean to see what was causing the ruckus. Under the waves "Alex" saw a humanoid fish, but had to come up for air before he could investigate further. However, the fishman followed him and punched him into a daze before departing. Rescued from drowning by Jack, "Alex" told the others what he had seen, but when he told how he had to come up for air, the others began to make fun of him, since he had temporarily forgotten that their uniforms could be modified in the otherdimensional Elsewhere to allow them to survive underwater. Searching the ocean floor for clues, Power Pack soon found some divers who were collecting some colorful globes and taking them to their ship. Appalled that the natural beauty of the waters was being despoiled, the Pack decided to board the divers' ship (called the Wild Thing) to see if what they witnessed was legal or not. Moments after boarding and noticing that the divers had "tons" of globes, the ship's captain immediately spotted them and ordered them to leave the globes alone. The ship was then attacked from below by an unknown attacker. The Pack used their powers to save the ship, but then a second attack broke the bow of the ship (where the majority of the globes were at), knocking some of the crew off and dropping the majority of the globes back into the water. "Mass Master", Lightspeed, and Tattletale spotted the fishman on the ocean floor, but the kids decided their top priority was to rescue the ship's crew from drowning, and left the monster for another time. Later at a local restaurant the kids discussed what to tell their father, only to be confronted by an angry "James", who had learned of their adventure from the head scientist that had been onboard the ship when it was attacked. "James" was upset that the kids had disrupted a legitimate scientific expedition, but calmed down when the Pack explained their side of the story. "James" apologized, saying that he still didn't know how to react to the kids" secret lives as super-heroes, and offered to rent a boat for them all as a way to relax. While out on the water, Franklin suddenly had one of his visions and asked "James" to turn the boat around. "James" angrily refused, saying they had come out there to relax, not get involved in yet more super-hero business, but "Alex" convinced "James" that helping to stop whatever bad thing Franklin saw happening in his vision was the right thing to do. They soon found the source of Franklin's visions was an attack by the fishman -- who Franklin identified as the Monster from the Lost Lagoon -- and his mate, who were trying to rescue their eggs (the globes the scientists were trying to study) from exploitation. Franklin convinced the Monster to stop his attack, while the rest of the Pack used their healing power on the Monster's mate, who had been seriously injured by the expedition's captain. Reunited with their children, the Monster and his mate thanked the Pack for their help, then left in their ship for space. "James" decided he was wrong to have not trusted the Pack from the start, and promised to be there for them from now on. (Power Pack I#62) - After dropping off "Alex" back in their home neighborhood so he could say good-bye to girlfriend Alison, "James" and the others returned to Four Freedom's Plaza to drop off Tattletale and to inform the Fantastic Four of their intention to travel to Kymellia and see if either Yrik or someone else there could remove the mindlocks from "Margret" and "James", and perhaps learn more of why "Alex" transformed the way he did. Meanwhile "Alex" found Alison talking with another guy, and thought that she must have decided she couldn't wait for him forever. Unwilling to let Alison see him in his transformed state, he said good-bye from several yards away, then ran off before she could turn and get a good look at him. Back at the Plaza the Pack said their good-byes to Tattletale and the FF while the Elan explained to Mister Fantastic that he was returning to his own sector of space. Taking a last look at Earth, "Alex" reflected on how everything was a miracle since Whitey gave them their powers (waaaay back in Power Pack I#1), and that it was Whitey who was the mysterious voice who "talked" to him during the Red Ghost encounter. He then relaxed, thinking he was in a sense finally going home. (Power Pack Holiday Special#1 - BTS) - At some point in their journey to Kymellia, Power Pack dropped off the Elan back in his own sector of space. Also at some (different?) point during the journey "James" developed his own set of super-powers. (Power Pack Holiday Special#1) - After Friday re-entered normal space in the Kymellian system, Julie tried to bring "Margret" out of her catatonic state by reminiscing about happier times, but was unsuccessful. While everyone continued to rest in either their seats or on a mattress, Julie reflected on recent events, and began to puzzle out what may have really happened to "Alex" and their parents. Observing this from his base, the Technocrat was persuaded by exiled Snark Queen Meraud to switch Lightspeed with another pseudoplasmic servant before Julie solved the riddle. The Technocrat transformed his servant Krenok One into a duplicate of Lightspeed, but before he could switch him for the real Lightspeed, the imprisoned Mass Master managed to escape from his containment tube and destroyed the machine used to reshape the pseudoplasmic servants into the four faux Powers, cutting off the signal keeping them in those shapes and causing the servants imitating Alex, James, and Margret, to revert to liquid form in front of the horrified Power children (and causing the fake Julie back on the station to melt as well). Before the Power children could do anything besides be horrified the Technocrat teleported Lightspeed off Friday and imprisoned her in a tube next to her recaptured brother. While Lightspeed and Mass Master compared notes on what was going on, Friday examined the remains of the three fake Powers, and explained to Counterweight and Destroyer what pseudoplasm was, and how it could fool even Kymellian scanners (not to mention the human Mr. Fantastic's scanners) into thinking the duplicates were living beings. Destroyer initially wanted to question the duplicates on who created them, but when he realized they would be unable to tell him anything (due to the duplicates not knowing/remembering they were duplicates to begin with) he and Counterweight reluctantly gathered the liquid remains of "Alex", "James", and "Margret" into Friday's ejection shoot, and dumped them into space before the orders to resolidify came through. Comments: Technocrat created by Louise Simonson (writer), June Brigman (penciler) and Roy Richardson (inker). The faux Alex, James, and Margret Powers were created by Michael Higgins & Seth Kruchkow (writers), Tom Morgan (penciler), Andy Mushynsky (inks). A character so obscure that he's not even listed on Snood's Master List :D (or at least he wasn't until I mentioned it). It's unclear from the story itself, but given his appearance it is possible that the original Technocrat had been a cyborg before transferring his mind into the satellite's computers. I am not sure if the Elan in Power Pack I#56-58 was supposed to be THE Infant Terrible, or just another juvenile member of its race. It never said, and no-one raised the subject of whether it was the Infant or not. Revealed in Infant Terrible's profiles in Annihilation#2 (as Delinquent), Marvel Legacy: The 1960s Handbook and the Fantastic Four Encylopedia. 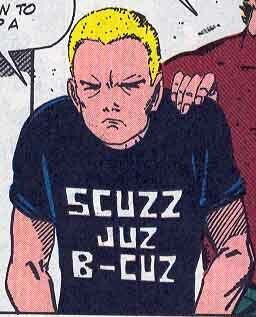 It was indeed Infant Terrible appearing in Power Pack. 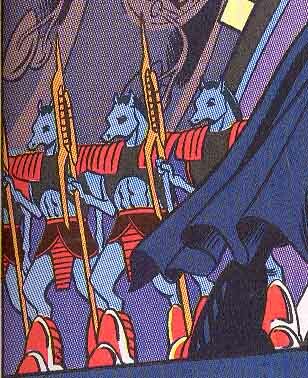 The quartet of aliens in Power Pack I#60 were from the planet Ciegrim-7, first introduced in one of the Hercules 2300 limited series. In Power Pack I#60 they had just crash-landed on Earth and were looking for some food when Morty inadvertently took control of them while playing with his toys. The Technocrat was invented for the sole purpose of retconning away some rather. . . . interesting. . . . . plotlines introduced in the last few issues of that Power Pack run, like Alex's tuning into a Kymellian, James Powers getting superpowers out of the blue, and Margret Powers's bizarre catatonic state. I THINK I got all the appearances of the faux Powers here, but since I couldn't find any listing of all the issues they appeared in anyplace (heck, I couldn't find anyplace that listed any of these guys as separate characters AT ALL, or even listed the Power Pack Holiday Special as an existing book!) there may be one or more I missed. If so, let me know and I'll add them in. Where Higgins and Kruchkow were planning on taking the alien visions "Margret" was having I have no clue, and as far as I know, it's never been touched on anyplace ever again. Come to think of it, if the Technocrat could do an exact "copy & paste" with someone's memories without doing harm to the original subject, then all he had to do was "copy & paste" from Dr. Powers to either his computers or to a pseudoplasmic servant, and sift through those copied memories to find the info he sought rather than going through the effort of kidnapping and replacing the actual Powers adults and sifting through their memories while on his station. But then there'd be no story usable to do a retcon with, so. . . . . Odd note on this version of the Marvel Super-Heroes comic: when searching for this online, I found that few listed this book at all under its own name, if listed at all. Mile High Comics had the series, but listed it under the title of Marvel Special Edition rather than as Marvel Super-Heroes. Not sure why they felt the need to list it under a title it never saw print under, since listing the publication dates would have easily distinguished this run from its 1960's predecessor. Go figure. The concept of a machine made from a semi-solid substance that could be formed into anything (including people) is not a new one, either in the Marvel Universe proper or in Science Fiction/Fantasy in general. It's been around for decades, at least. For all I know, John Campbell or Hugo Gernsback or someone in their stable of writers invented the stuff in a story someplace waaaaay back in the 1920's at least. It was stated that the technology to create pseudoplasm was destroyed when the spacestation Kymellia II was destroyed. Given the size of his own spacestation, the Technocrat should have had no problem duplicating the process in his own place rather than relying on Kymellia II to produce it for him. The only reason I can think of for why he couldn't produce pseudoplasm after Kymellia II exploded was that his process for creating it required the presence (or the by-products) of live Kymellians to succeed, which was the one thing Kymellia II had bunches of but the Technocrat's spacestation lacked. And it's probably advisable to not think too hard on that, unless you really want to be totally grossed out by what biostuffs the process might require. . . . .
All in all, I rather liked this guy; he had a neat visual to him. And given his merging with a computer, he could very easily have had a back-up someplace that escaped his station's destruction, and could somehow recreate his body again, as well as those of his servants, including the faux Powers. but have no known connections to any other "Powers" characters running around the Marvel Universe. The Technocrat's servants in their originally programmed forms were indistinguishable from real Kymellians, exact copies down to a molecular level. They could also be programmed to believe they were "real" Kymellians rather than artificial ones. The Pseudoplasmic servants could also duplicate the native powers of the Kymellians, though to what extent they could do so remains unrevealed. Krenok One The only one of the Technocrat's servants referred to by name, he was chosen to become the duplicate of Lightspeed (Julie Power) when the Technocrat realized that Julie was close to realizing the truth of his deception. He was transformed into an exact copy of Lightspeed, but was seemingly destroyed before he could be switched out with the real Lightspeed. The powers he had in his original form are unrevealed. As Lightspeed, he would have had her power of flight, but that was never put to the test. The original name of this pseudoplasmic servant is unrevealed, as is what powers she had in her original form. As "Margret Power" she had all the real Margret's memories and desires, plus her artistic abilities. Unfortunately, her original programming began to overwrite the new programming, leaving "Margret" just unstable enough to go into a semi-permanent catatonic state when presented with the knowledge that her children had super-powers. While in her catatonic state she also saw visions of attacking aliens and their battles, though who these aliens were have never been revealed. Technocrat's base was a spacestation the size of a moon (and possibly was originally a moon converted to house a humongous underground spacestation), which he presumably built himself, and which became his home after being exiled from the other Kymellians. The base was destroyed when Meraud tricked him into firing a missile through the station in an attempt to kill the smartship Friday, but Meraud "accidentally" jostled the missile launcher and the missile instead tore through the fission chamber that powered the satellite, causing the explosion.